In the wake of an “extremely tense” APEC summit earlier this month, which numerous observers described as a failure, anticipation has been building for even more conflict when leaders from the Group of 20 countries convene Friday in Buenos Aires. The G-20’s 13th summit marks the first time the meeting has been held in South America. Has Argentina prepared to host the event well from a logistical and security perspective? Which countries and whose priorities will most likely dominate the event and its agenda? 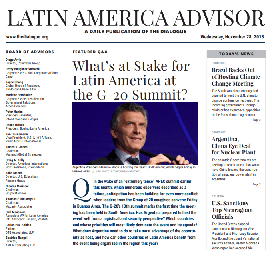 What does Argentina need to do to take most advantage of the opportunity as host, and how can other countries of Latin America benefit from the event being organized in the region this year?